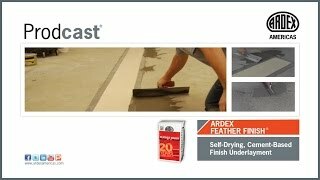 ARDEX FEATHER FINISH® is an underlayment formulated from a blend of Portland cement and other hydraulic cements that provides a smooth, permanent finish for a variety of substrates prior to the installation of today’s demanding floor coverings, including sheet vinyl and VCT (vinyl composition tile). Coverage will vary depending on the texture of the surface being smoothed. Storage: Store in a cool, dry area. Do not leave bags exposed to sun. Protect unused material by removing air from bag and sealing tightly. Warranty: ARDEX L.P. Standard Limited Warranty applies. Also eligible for the ARDEX/HENRY SystemOne™ Warranty when used in conjunction with select HENRY® Flooring Adhesives. For complete product technical information, click on the Downloads tab and open the Technical Data download. ARDEX has been at the forefront of the tiling and flooring industries for over 50 years. ARDEX continue to offer unbeatable quality and cost effective solutions for building projects covering all sectors of business and commerce, such as retail outlets, leisure centres, health authorities, transport premises, art and educational institutions.